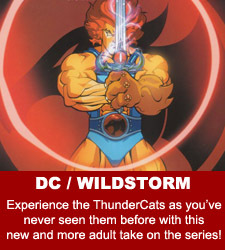 Welcome to our ThunderCats Comic Section! 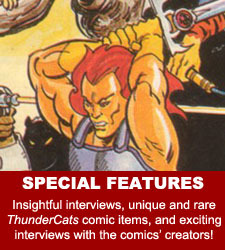 Here you can view the cover art and read detailed synopsies for many ThunderCats comics, as well as learn more about the creation of your favourite issues. 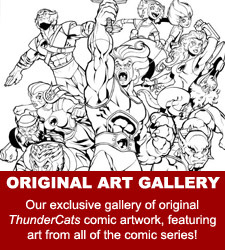 We are especially proud of our Original Comic Art Gallery, which features well over 100 pages of artwork from some of ThunderCats‘ most famous artists! With its high-energy, visually arresting excitement, and with its huge fan-base, it was almost inevitable that ThunderCats, one of the most successful animated series of the 1980s, would make its way into comic book form. Continuing the adventures of Lion-O and his comrades as they fight against the forces of evil, the first ThunderCats comic book was published by Marvel Comics’ subsidary brand, Star Comics, in December 1985. 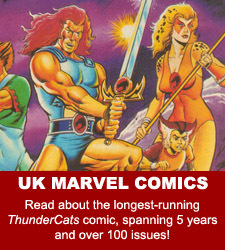 In the UK, Marvel also produced a weekly ThunderCats comic series, which ran for a staggering 129 issues. 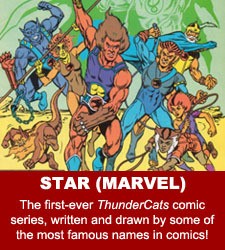 More recently, the ThunderCats returned to comic book stores in 2002 with several mini-series and specials, this time all produced by Marvel’s old rivals DC under their Wildstorm brand. Over the course of the coming months, our aim is to showcase every ThunderCats comic ever produced, and so we hope that you will check back often for updates! Prized by collectors and loved by fans, read on and discover why ThunderCats comics are some of the best of the best!